My time is really important to me. I know the saying goes “time is money” but I don’t see a waste of time as a waste of money. I merely see it as a waste of time! I value my time and try to ensure that I give it the respect it deserves. If I make an arrangement to see someone I will always arrive early. If I make an appointment with a service provider I always ensure I get there with time to spare. I never cancel arrangements at the last minute unless a crisis has arisen that cannot be avoided. I get frustrated when traffic jams delay me as I will run late through no fault of my own. I allow extra time to get somewhere and always ensure I leave for my destination earlier than necessary. This same philosophy falls over into my kitchen. I do not like following recipes that are not accurate – they waste time. Or recipes that do not work. So, when I write a recipe down I try to pay particular attention to each detail and ingredient in order not to waste the time of the person trying the recipe. I also like to make dinner in an hour – no rushing through the process but if I start cooking at 18h00 we can eat at 19h00. This is important as time seems endless during the summer months when the sun sets after 21h00 and the days oh so shorter when the sun has set by the time I get into the kitchen. My pasta dishes are a time winner as they take about 30 minutes each from start to eating – and when you are rushed for time, this is a blessing! I think there are crayfish here in some mountain streams somewhere, but unfortunately they don’t find their way to market. I may have to go foraging for them. Or not. At any rate, perhaps shrimp would stand in. And, I’ll sip a Bloody Mary while whipping this up. WOW, this is my kind of food!! 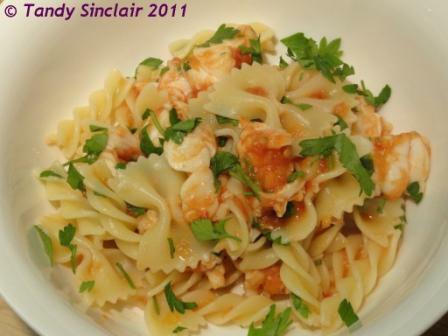 I love vodka in tomato pasta sauces, it really adds such amazing flavour and I love, and am jealous about your use of crayfish. Making this pasta a truly luxurious dish. I have very little appetite at the moment, but I am sure a bowl of this would make me feel much, much better. What a decadent dish. I like that you used two types of pasta.